Since my all-time favorite show, “The Walking Dead” is now on hiatus, I’m keeping my eyes on Syfy’s newest show, Defiance. My review of last week’s pilot show was not only my way to introduce you and me to the premise and characters, but also for me to understand why my oldest grandson, Jimmy was so hyped over the X-Box Defiance game. I asked if I could play the game with him. He agreed, but I was sorry I asked. Why? Find out after the jump. I need to explain something about myself. I’m a geek at heart and love everything Geek, like technology, science, genetics, space exploration, Space X, robotics, Zombies, but I have one problem, I’m tech challenged and this revelation will help you to better understand why I had such a problem learning the game. My younger grandsons, Nathan and Josh love playing video games with me. Believe me, it’s not because I’m any good at the games. It’s more that I’m so bad at them, that the boys consider me their personal comedy sitcom. 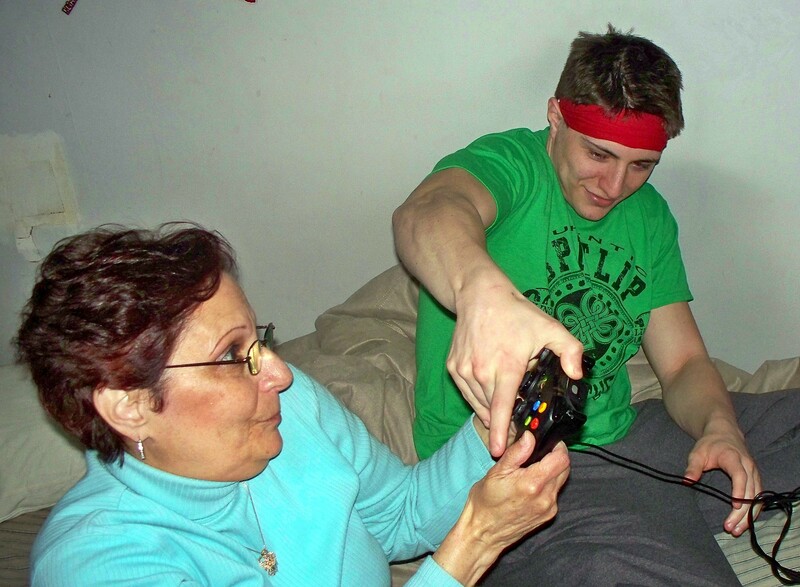 But the oldest grandson, Jimmy, usually shies away from playing games on his X-Box with me. I don’t know why? But after much pleading and bribing on my part, he finally agreed to play Defiance with me. For non-players like me, the first thing you need to know is that the game is slightly different than the show. On the show, the action takes place in St. Louis, but on the game, we’re in an active war in San Francesco. To be able to play, I needed to create my own avatar and I already knew who I wanted to be…but there wasn’t a Michonne avatar…rats! If you have teenagers in the house, I don’t even have to explain the attitude they can dish out… Jimmy has won Academy Awards for his attitude, especially when dealing with family. Jimmy and I begin to scan through the many avatar selections offered in the game. 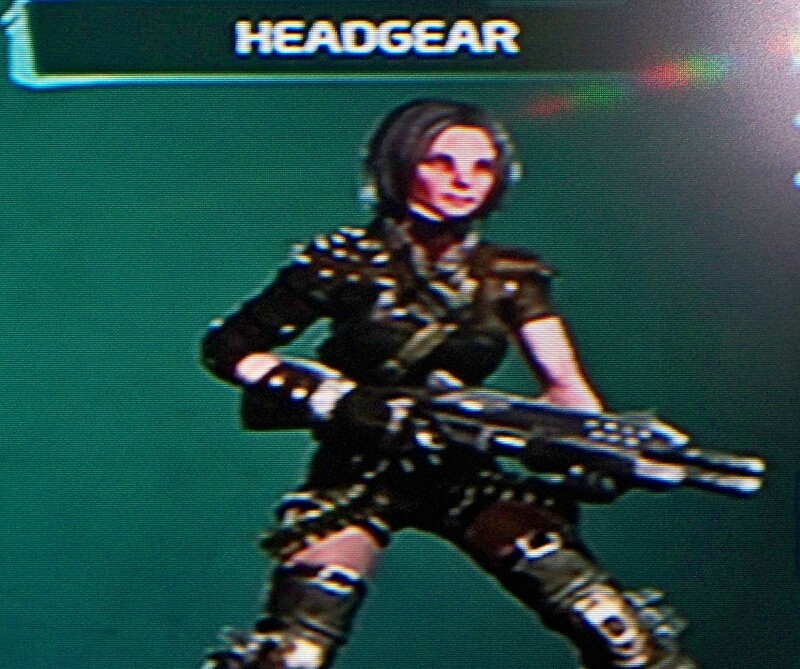 My avatar of choice was a female Irathient outlaw. The next step was to design your avatar by selecting bone structure, nose shape, skin color, and lip size. Really, lip size? Was my avatar planning on kissing someone during the game? “Don’t give me big bones,” I told Jimmy, but when I started to complain about Tetria’s (my avatar’s name) hair style, lips and outfit, events slowly began to go downhill. When we did begin the actual game, our avatars are on a ship, and one of the commanders is shouting out orders. Then something goes wrong with the ship. Are we being attacked? Did I press the wrong button? All I know is that Tetria has to get inside a pod and is soon jettisoned into a hostile area. Say what? 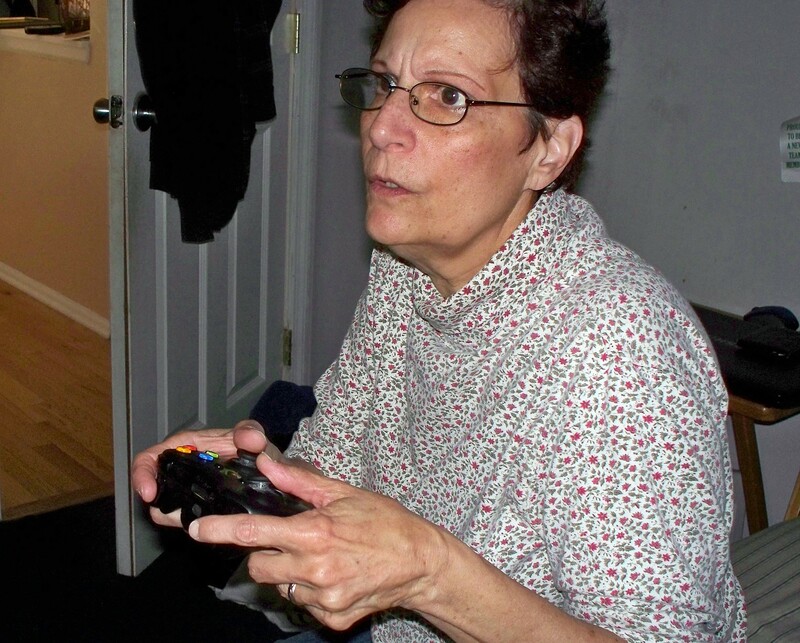 I can’t walk and chew gum at the same time, but obedient, tech challenged, granny that I am, I start playing the game. I have no idea what the hell I’m doing. “Granny, you have to shoot back.” I’m constantly instructed by my grandson who is growing more and more frustrated. “They’re moving too fast and how do I tell the good guys from the bad?” I ask, but sadly, even with his help, I end up shooting my own team. Nathan’s suggestion that the “look sensitivity” be slowed down did nothing to help. If my avatar went any slower, she would be moving in reverse. After less than thirty minutes of my disastrous playing of the game, the controls were taken from me and I was banished from his room. Teenagers have no patience! 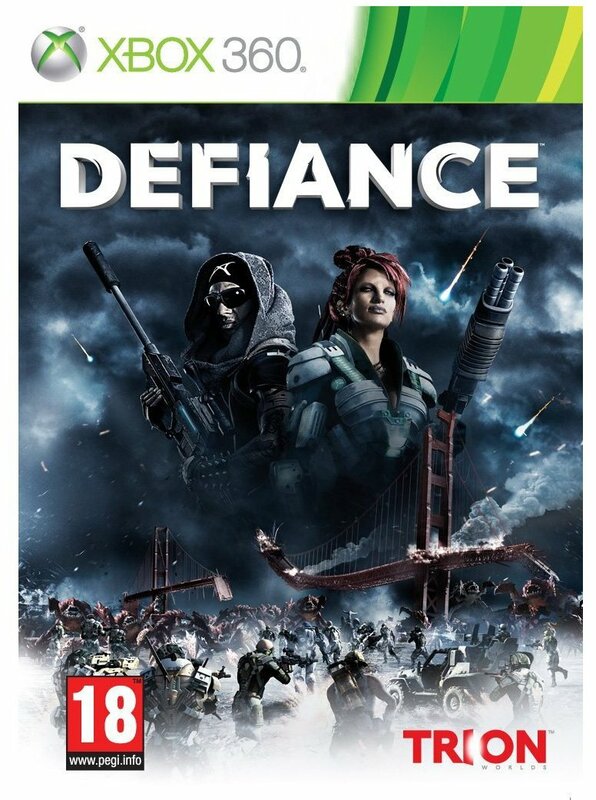 Below are my thoughts on Defiance the show. I swear if you put the characters in western outfits, its Deadwood all over again. You have good cop Nolan (Grant Bowler) and two honest deputies, Irisa (Stephanie Leonidas) Nolan’s adoptive Irathient daughter and Tommy (Dewshanne Williams) trying to keep peace in a powder keg, post apocalypse, St Louis. There are good and bad aliens, but with Castithans Datak and Stahma Tarr, the townsfolk of Defiance have a dictatorship in the making. The new mayor Amanda Rosewater (Julie Benz) is unaware that the former Mayor has treacherous plans to destroy the town of Defiance with the help of Mr. Birch (Steven McCarthy). Why, not sure yet? Because of an explosion in the mines owned by Rafe McCawley (Graham Greene), Nolan gets to see old St. Louis. The city was terraformed and is now below ground. I wished they would have spent more time in the old city. I had questions that weren’t answered. Aliens and humans alike have to adjust to a new world with new rules. And that goes for the Tarr’s and McCawley’s, who represent a futuristic version of the Hatfield and McCoy Feud. But, for now they have to play nice, because their children Alak (Jesse Rath) and Christie (Nicole Munoz) are in love. I like the show and enjoy watching it, but I really want to learn that game. After reminding Jimmy of the many times I talked his parents out of sending him away to Military School, he finally relented and promised to be more patient teaching me the game. I’ll let you know how that goes. 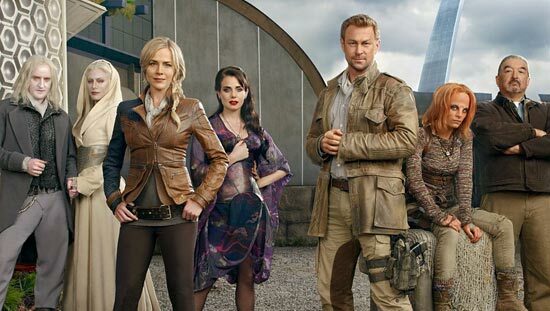 Defiance airs Monday nights at 10 on Showcase. I feel like I was with you trying to play the game. Funny. Love this show. Pingback: Interview with Jaime Murray of Defiance, Part Two | Biff Bam Pop! Pingback: February Faves: Marie Gilbert’s Favorite Sci-Fi Shows | Biff Bam Pop!